Everybody, grab your salt shakers for an enormous grain to take with this rumor; take this with a grain of salt. John Cena, the champ, might be playing Stryker in the upcoming Mortal Kombat 11. There are quite a few reasons why this might be untrue, but here’s to hoping. Mortal Kombat 11 is set to release on April 23rd of this year. A lot can happen and a lot of news can break about this game between now and then. Last month, NetherRealm released a trailer featuring Ronda Rousey as Sonya Blade after she dropped hints about her involvement. Maybe this Mortal Kombat 11 rumor will pan out as well. 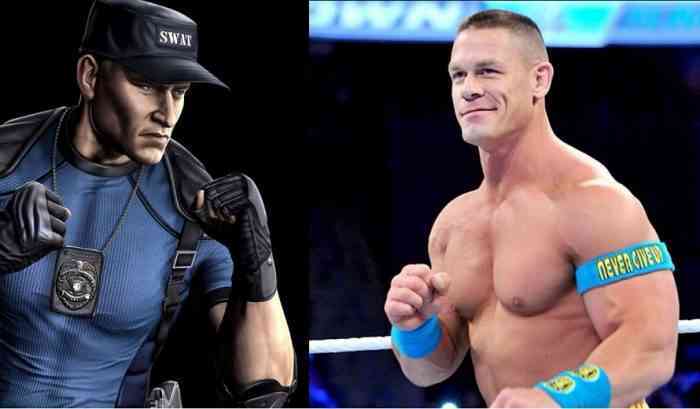 So, what makes us think that John Cena will be Stryker? Well, about four days ago, he posted an image of Stryker on his Instagram account. His account bio reads “Welcome to my Instagram. These images will be posted without explanation, for your interpretation. Enjoy.” That blanket statement does not give us a whole lot to go on with this rumor. Most of the images he posts are photoshops of a series of Stone Cold Steve Austin photos with various other heads in place. Some include Sora from Kingdom Hearts, Macho Man Randy Savage, and Santa Claus, so who knows what to think? Reasons why is rumor might not pan out are few, but important. Numero uno: Stryker has not been mentioned or included in Mortal Kombat 11’s roster. Also, the image Cena shared does not have any hinting text attached like “soon…” or “Get ready” or anything like that. Most importantly, this comes from John Cena and not NetherRealm. I would personally love this, but it’s still likely that… we won’t see him. What are your thoughts on the John Cena rumor? Let us know in the comments below. And be sure to stay up to date with all our Mortal Kombat 11 news on our site.